The Placerville City Hall is located in what was once known as the Confidence Engine Company Building No. 1. The Confidence Engine Company wasn't Placerville's first.The first Placerville Fire company was organized on June 23, 1853. Called Neptune Hose Company #1, its motto was, we're Ready. The building was erected in the fall of 1860. 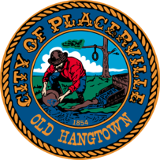 The Placerville City government has been located there since 1902. The building located to the east of the Confidence Building was W. M. Donohue & RH. Black's Confidence Building to form the current City Hall.